Yep that’s true scientist just detected half of the missing normal matter in the Universe. “Everybody sort of knows that it has to be there, but this is the first time that somebody – two different groups, no less – has come up with a definitive detection,” says Ralph Kraft at the Harvard-Smithsonian Center for Astrophysics in Massachusetts. Observations of galaxies and galaxy clusters in the local universe can account for only 10% of the baryon content -made of particles called baryons rather than dark matter- inferred from measurements of the cosmic microwave background and from nuclear reactions in the early Universe. Locating the remaining 90% of baryons has been one of the major challenges in modern cosmology. The missing links between galaxies have finally been found. This is the first detection of the roughly half of the normal matter in our universe – protons, neutrons and electrons – unaccounted for by previous observations of stars, galaxies and other bright objects in space. Models of the universe say there should be about twice as much ordinary matter out there, compared with what we have observed so far. 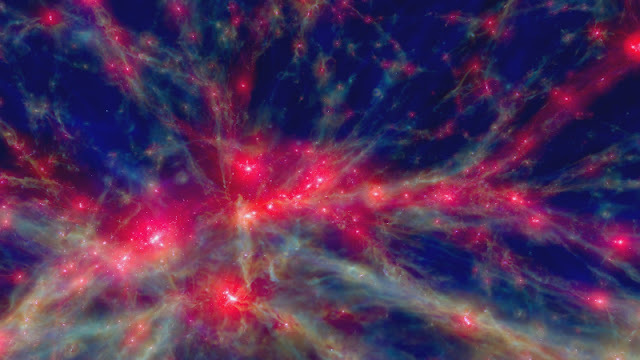 Now, two separate teams found the missing matter – made of particles called baryons rather than dark matter – linking galaxies together through filaments of hot, diffuse gas. “There’s no sweet spot – no sweet instrument that we’ve invented yet that can directly observe this gas,” says Richard Ellis at University College London. “It’s been purely speculation until now.” Because it's not quite hot enough for X-ray telescopes to observe. Both teams took advantage of a phenomenon called the Sunyaev-Zel’dovich effect that occurs when light left over from the big bang passes through hot gas to find another way to definitively show that these threads of gas are really there. As photons of light travel, some of them scatters off the electrons in the gas, leaving a dim patch in the cosmic microwave background from the birth of the cosmos that were to faint to be mapped by the Planck satellite in 2015. Tanimura’s team stacked data on 260,000 pairs of galaxies, and de Graaff’s group used over a million pairs revealing firm evidence of gas filaments between the galaxies. Tanimura’s group found they were almost three times denser than the mean for normal matter in the universe, and de Graaf’s group found they were six times denser confirming that the gas in these areas is dense enough to form filaments. “This goes a long way toward showing that many of our ideas of how galaxies form and how structures form over the history of the universe are pretty much correct,” says Ralph Kraft.